about my clients and their success. My philosophy is that ‘running with your strengths’ — the things you are naturally great at doing – will take you farther than trying to become well-rounded and develop your weaknesses. Do the things you are best at doing! You’ll be happier, more productive and experience greater success. I haven’t always been an executive coach. I grew up in Ephrata, in Eastern Washington, and graduated with honors from Washington State University with a BA in Communication – Journalism. 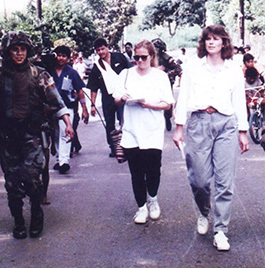 In a varied career as a TV news reporter, anchor and producer, I’ve covered everything from the downfall of General Manuel Noriega in Panama with U.S. Army troops — to the Loma Prieta Earthquake near San Francisco — to the WTO riots in Seattle. I’ve jumped out of planes, learned to scuba dive, flown with the Blue Angels, and danced with the Seattle Mariners’ groundskeepers – all in search of a great story. When it comes to stories, the ones we tell ourselves matter the most. After all, we actually listen to what we tell ourselves. 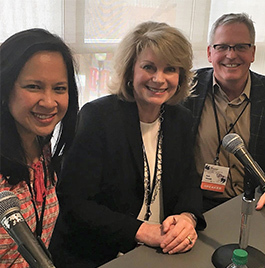 When I left the news desk, I had the opportunity to work with leaders to develop their personal brand, communication skills, and executive presence. That led me to executive coaching, completing a rigorous training certification program, and obtaining my International Coach Federation (ICF) credential. One of my superpowers is ‘equanimity’ – the ability to remain calm in the face of chaos. As a news anchor in the middle of breaking news, I was calm while presenting information to our viewers. Behind the scenes in the newsroom, people were often scrambling for the latest facts so we could move the story forward, inform viewers, and stay ahead of the competition. As a coach, equanimity is still one of my superpowers. A client can come into a session feeling overwhelmed, emotional or uncertain about which way to go. I’m a calm, safe haven so you can take a deep breath, relax, and together we can start to figure out what you want, and create a plan on how to get there. affiliate in Seattle, where I co-anchored the nightly news. In Panama reporting on U.S. Army troops capturing President Manuel Noriega. 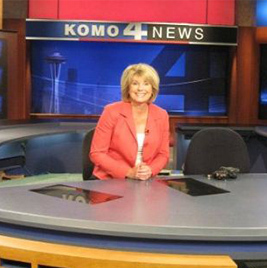 Manning the anchor desk at KOMO News, the ABC affiliate in Seattle, where I reported and anchored weekends and mornings. 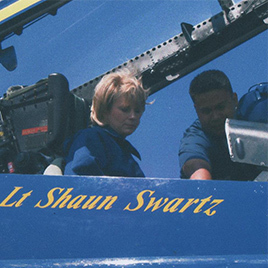 Flying with the U.S. Navy’s Blue Angels — one of the thrills of my lifetime! Interviewing “What Not to Wear’s” Stacy London, and yes, I agonized over what to wear! 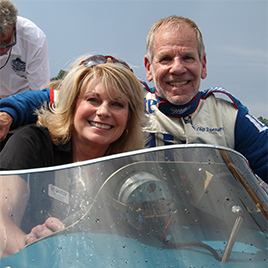 Checking out the seat of an unlimited hydro with all-time great hydro racer Chip Hanauer. Part of a panel on ‘Personal Brand: What do people say about you when you leave the room?’ at Washington State University.